Roger Federer is into the last eight at the Miami Open with an impressive 6-4, 6-2 victory over Daniil Medvedev in 1 hour and 1 minute. In a match that was due to be played last night only to be washed out by thunderstorms, the Swiss enjoyed the daytime conditions to play solidly throughout. Making just 8 unforced errors in the match and converting all three of his break points to make the Quarter Finals in Florida for the eleventh time. 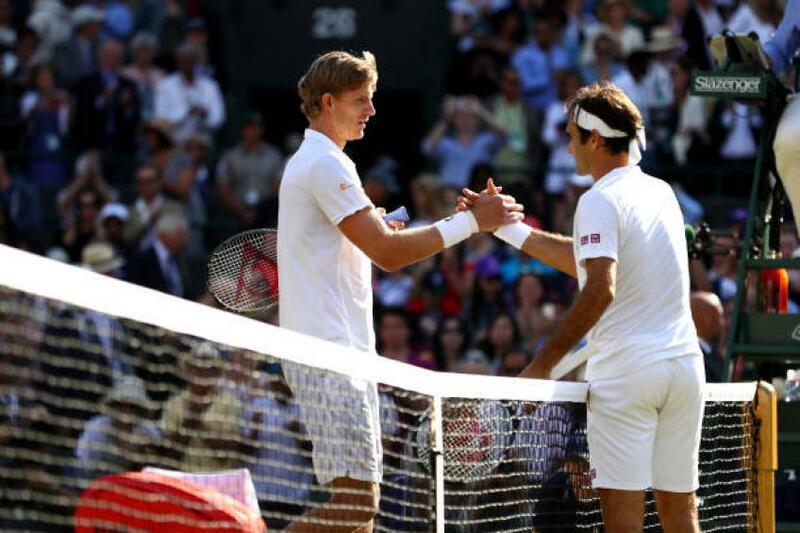 The win sets up an encounter with Roger's Wimbledon conqueror Kevin Anderson who enjoyed a day off today after defeating Jordan Thompson yesterday. Federer won the toss and elected to receive. Medvedev kicked off with a solid hold to fifteen for 1-0. Roger soon levelled with a hold to thirty but Medvedev showed some early signs of what he can do from the back of the court with some crisp hitting. Federer then created a half chance at 15-30 thanks to a line finding inside in forehand but the Russian fired an ace, reeling off three points in a row to hold for 2-1. The pair then exchanged two love holds each as the score moved to 4-3 in favour of Medvedev. Game eight finally saw a point won on the return but Roger held to thirty to level at 4-4. A perfectly executed drop shot then got Roger into game nine and at 15-30 he came out on top of a 34 shot rally, opting to slice virtually every backhand which Medvedev struggled to be aggressive on. That created two break points and he converted at the first time of asking to lead 5-4. If Roger's previous service games were any indication, serving it out would be straightforward but he slipped to 0-40 after Medvedev hit some solid groundstrokes. The Swiss saved all three with smart serves and took the set 6-4. Hitting 14 winners to 5 unforced errors and landing 75% of first serves. Into set two and a rattled Medvedev dropped serve instantly before Roger consolidated to 15 to lead 2-0. 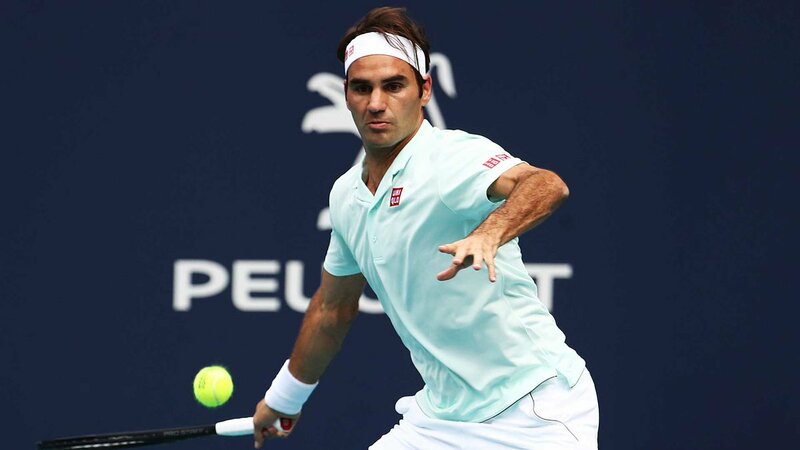 The Russian got himself on the board in the next game but Roger held to love in no time for 3-1 and the Swiss was soon up 4-2 with more rock solid play. In game seven Medvedev found himself up 40-15 but Roger showed exquisite court craft to flick a pass and Daniil imploded, missing a tentative forehand then hitting a wild double fault on break point to slip 2-5 down. The Swiss then served it out to thirty to take it 6-2 and move into the Quarter Finals. I thought it was an interesting match. There were really long rallies, tactical points. The big points went my way and that was the difference. I'm serving great this week and hope I can keep it up in the next round. A super performance here from Roger and after a wobbly-ish start against Albot he's settled nicely into the tournament that has seen several of the top seeds fall around him. Today I thought he played spot on tactically and his whole game was in tune whether it was serving, moving forward, defending, or mixing it up, everything clicked. Like I mentioned in previous posts and comments, the surface here does not really reward shotmakers like Medvedev and he quickly ran out of ideas when hitting flashy winners wasn't possible. 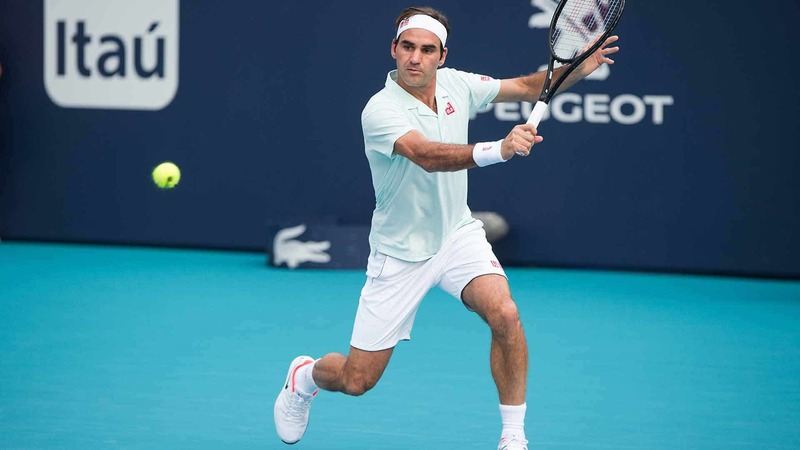 You need to be able to put the ball away when you get the chance but it's more about working angles and crafting points and that's exactly what Roger did. Once Medvedev was down a set he had to go for more and Roger was able to ask him all the right questions and make him play one more ball time and time again. Showing great patience and variety to mix up his pace throughout the two sets and those tactical 34 and 35 shot rallies were great to watch. So peRFect performance really, moved great, served great and played great 🙂 can't ask for more. If you beat me at Wimbledon, you’ve got my attention. Kevin is a great player, he's got one of great serves in the game at the moment. On America on hard courts, that's his cup of tea, but I'm playing well and I hope I can bother him. Next up is big-serving Kevin Anderson who is playing his first tournament back after a spell on the sidelines with an elbow problem. The South African has been one of the most consistent guys on the tour over the last two years and on his day can be very dangerous as we saw at Wimbledon last July. The 6th seed hasn't had it easy though in his first three matches, struggling against Munar in the second round and all the sets he's played since have looked fairly tight. I get the feeling he's the type of guy that needs quite a few matches in his racquet to get up to a high level so hopefully, Roger can take advantage of the fact he's relatively under-tennised this season. Fed leads the H2H 5-1, with four wins on hard court and I think needs to continue in the same style as today, mix it up, make Anderson move and look to put him in awkward positions on the court. The match is at night so that perhaps favours Anderson slightly as he can still serve through the court and if he has a top drawer serving day anything can happen but I like Roger's chances. What did you guys think of the win against Medvedev? Predictions against Anderson? Let me know in the comments. Impressive performance from Roger who showed off several facets of his game to dominate in all areas and come through in just over an hour. Just watched the replay, as not being on the chair before. Looking forward to read you Jon, but had to take my maybe only chance this year! I think Danil had a cold, and from 4-4 in first just smoldered away somehow. But Fed played nontheless beautifully majestic IMO. Congrats to him and his camp and everybody cheering on him! Super fast post just as Fedex, Jonathan! Brilliant match tactically, you hv said it all J. Slice was perfect tonight and found some V sharp angles with his FH. Stats don’t lie on serve either! Night match v Kev! Damn was hoping for day but ok. Sorry my phone didn’t work well on the user rating. I tried to give it a 5 but it came out as 1.5… Can you just erase my vote Jonathan? Thank you for the fast write up! Is it confirmed that the match versus Anderson will be at night ? Ah well saw somewhere (a usually correct betting place) that it be 11 in the morning. Could be wrong of course. Where do you see the schedule? Not on my atp tennis (nothing about thursday yet)! Well well, now it came on, of course. YOU are right, in the night – 7 pm that is midnight here, and 11 with you I suppose. Yeah the betting sites just list the matches and put 11am for them all before the schedule is out. Out Manoeuvres Medvedev – love the headline! PeRFect performance indeed. Such a joy to watch when he plays like today. He was sharp, patient yet agressive, with some smart tactics. The defence was also unreal, moving left and right on the baseline like a crab on the beach. As for tomorrow, hope for a match like Nitto Final O2 last year. Roger came through when it mattered, got all 3 break points as you mentioned. The lack of UFE made it a good match to watch. Fed passes Thiem on the live rankings too to take back 4th place. Thanks for the quick write up Jonathan. Cheers, just added the interviews etc as well. Amazing!! Loved Roger’s strategy, those “easy” rallies, calmly waiting for Medvedev to mess up. Cute moment when Roger challenged the call and then acknowledged that the line judge got it right. Thanks, just added ESPN and Press Conference too. Everything firing, just always seemed like he had more court craft & experience than his opponent. KA will be a tougher test (as it should be in the QF), but if he can bring this level I’m hopeful he can get it done. Ah yes definitely, a blessing in disguise that it wasn’t played at night in those heavy conditions. Glad to see the match was only an hour, so he shouldn’t be too disadvantaged by having to play 2 days running when others have had a break. This Shapo fan got to sleep after 2:00 am my time because his match went so late, but it was a compelling match, with both Denis and Stefanos playing extremely well. But thank goodness Shapo won, so I could feel that staying awake was worthwhile. And thank goodness they changed Fed’s match. To have still played it last night (or more accurately, early this morning) would have been cruel to the players and the fans as well. I was happy for sure, checked at 1.30am and realised it wasn’t going to be played. Back to sleep. Great to watch Roger in full flow. Like you mentioned, he did everything well and with that kind of UFE stats, he can beat anyone. He has been serving great and he needs to keep that up tomorrow as Kevin will be serving his usual. Hope Roger can keep this up for 3 more matches as he will be facing good opposition even with only him as the remaining top 5 player in the draw. Never thought slowami would turn out so good. His perfect stats in BPs faced and converted made this match a lot easier. Not going to be that easy against big servers like Kevin and Isner. Isner is looking like he’s on a mission to defend his title, no sets dropped. Great performance from Swiss Maestro. As he said, he got great rallies and serve as well as drop shots and backhand was on point. Now Kevin is the next, so I guess it will be a tough match again. But I think roger will be more cautious than ever since he beat him on his favorite surface. Hopefully, he can beat K-Bomb on his favourite surface. himself that great quote ‘He’s got my attention’! Thanks to everyone here with great perceptive comments and thanks, Jonathan, for a really quick write-up. That dropper did seem to derail him even more. Ahh, who doesn’t love this dad?! Thanks for the ESPN Interview, Jonathan. He deserves the highest grade. Of the result, we should be unafraid. And his talent doesn’t fade. An arena to be renamed ? An avenue ? A promenade ? like this one : Swiss-made. The tall Kev to smash first today, Fed. Keep focus and go ahead ! What? Fed played 30+ shot rallies and won based on patience? 8 unforced errors? Excuse. I’ll pack my bags to the Twilight Zone. Wait, no: he slipped to 0-40 when serving for the set. All normal, then… hehe. Nah it was all a dream! He likes to keep his fans on the edge (of a heart attack). FAA is playing really well. Not sure about his return game though. He is tough and talented. Glad couple of Canadians are looking real good. Finally some hope for nextgen. The most enjoyable match to watch this year? Hey, did you notice, Fed is the only European standing in the draw! When has that happened in the last few years? First set 6-0 to Federer, and a break up in the second. Anderson’s movement isn’t at its best and Federer’s picking him apart completely. Hopefully he can keep it up. Set 2 turned out to be closer, Anderson broke back but in the end Federer gets the job done in straights. Now for Shapovalov, who’s twice come back from a set down in this tournament. He beat both Tiafoe and Tsitsipas, quality players, so he’s going to be tough. C’mon Roger! I just woke up for a pee, checked the scores and whaaat? 60 64? Yes right. Can’t wait for my replay! I just read that his all-time percentage of breakpoints converted is well below…but how about his percentage of creating them? Must be huge! And as long he’s creating enough to just break and win, all is well with me.